An Inspector General who is also Ultraman – that is a rarity. This is the story of Krishna Prakash, IPS. It is also window to the change a city marathon can spark. The Mumbai Marathon, long sponsored by Standard Chartered bank and now Tata, has been a life-changer for many people. In 2013 it changed the life of Krishna Prakash, at that time heading the police force in South Mumbai and thereby tasked with overseeing security arrangements for a host of sporting events ranging from cricket matches of the Indian Premier League (IPL) to the city’s annual marathon. A second generation police officer, he hails from Hazaribagh in Jharkhand. Located roughly 2000 feet above sea level, Hazaribagh – the name means land of a thousand gardens – features a landscape of hills and forests. On a more somber note, it is also home to the second highest coal reserves in Jharkhand. Krishna Prakash’s father served in the police, retiring as a Deputy Superintendent. One of five siblings, Krishna Prakash – born 1971 – attended St Robert’s school and later St Columba’s College, from where he majored in history. During all this time, his interest in sports was never exceptional. In his free time as a child, he ran around in the local hills, swam in the local river and the reservoir of a nearby dam – like many children do. At school, an institution blessed with adequate playgrounds and providing room for sports in the curriculum itself (there was time specifically allotted for sports), he stayed as active as anyone growing up in such circumstances would. “ I played but I was not a sports person per se,’’ he said, outlining his nature from those days. Following college, he spent two years with the Nehru Yuva Kendra (NYK) doing social work. In 1995, he decided to appear for his civil services exam. The exam has a three tier selection process. His first two attempts took him past the first two stages of selection. On both occasions he lost out in the third, the interview stage. On his third attempt, he cleared all three stages and placed second among candidates qualifying from Jharkhand. Selected for the Indian Police Service (IPS) and awarded the Maharashtra cadre, he trained over 1998-99 at the Sardar Vallabhbhai National Police Academy in Hyderabad. In 1999, he moved to Maharashtra with his first posting at Gadchiroli. The second least populous district of Maharashtra, Gadchiroli is partly hilly terrain and has a strong tribal component to its population. It is also among districts affected by the extreme left movement. In the following years, he worked at Nanded, Malegaon, Buldhana, Amaravati, Sangli and Ahmednagar before shifting to Mumbai as officer in charge of South Mumbai’s police. Through these postings and transfers on work, he maintained interest in sports but as at school and college long ago, it stayed in the background. “ I used to play football and badminton regularly. I also participated in work-outs with my team from the police, to stay fit. But that was it,’’ Krishna Prakash said. Posted to South Mumbai, sports drew closer. The bulk of the Mumbai Marathon route, including its start and finish lines, are in South Mumbai. Given charge of security arrangements for the Mumbai Marathon, the IPS officer found it hard to keep his curiosity for the event and the experience it offered, under check. It was tough to merely watch from the sidelines and not run. Especially given an instance from the past that hinted he had what it takes to be in endurance sports – during his training days, at a competition at the police academy in Hyderabad, he had been runner up in cross country running, swimming and yoga. Knowing that, how do you keep the attraction of the Mumbai Marathon at bay? He succumbed. In 2013, Krishna Prakash’s superiors approved his request to participate in the event on one condition – his running should not affect the duties expected of him at the Mumbai Marathon. That year Krishna Prakash ran the half marathon segment of the event without any prior training. “ I ran it because I wanted to. There was the wish to run the half marathon. There was no preparation,’’ he said. He covered the 21 kilometer-distance in two hours, seven minutes. Immediately on completion, he changed his attire and resumed his work monitoring security arrangements; it is typically around the time the half marathoners finish that the Mumbai Marathon’s seven kilometer-Dream Run segment featuring the largest chunk of participants, commences. The switch over from half marathon to official duties, worked neatly. Krishna Prakash has participated in the Mumbai Marathon every year since that debut in 2013.Not just that, like many in the city bitten by the bug, he began running at half marathons elsewhere – in Delhi, Pune, Kolkata and Satara. “ This was how things were; till 2016, then everything changed,’’ Krishna Prakash said. Thanks to Mumbai attracting people from all over India and thanks in part to the Hindi film industry locating many of its stories in the city, some of Mumbai’s suburbs are as well-known in India as the city itself. Dadar is one of them. More than a century ago it had gained distinction as the city’s first planned suburb. In the years that followed, it has been a popular backdrop for Mumbai life in media and conversation. Today Dadar is a busy and noisy convergence of people, shopping, rail and road transport. Its bylanes are comparatively quiet. It was late May 2018. We were at Krishna Prakash’s office in one of the bylanes of Dadar. He was now Inspector General of Police, overseeing VIP security. The change of 2016 he referred to, had happened some 260 kilometers away in an altogether different city and district – Satara. Surrounded by hills, Satara is home to the annual Satara Hill Marathon. The route features gradients. By then, a regular runner of the half marathon, Krishna Prakash ran the half marathon at the event. He ended up with severe pain in the knees. The doctor he consulted painted a gloomy picture – surgery appeared solution and running seemed finished. “ It was October-November 2016,’’ Krishna Prakash said of the incident. Like many searching for more views than one on life’s troubles, he looked up the Internet to see what it had to say on knees made painful through running. He came across information indicating that problems with knees could be overcome by strengthening muscles directly and indirectly related to their functioning. He also came across information that highlighted the importance of food and food habits for runners. There was a third angle he required to address. His uric acid level was up; that had to be brought down. According to Krishna Prakash he is largely self-taught in matters of training for sport. He proceeded to address the new options discovered. A longstanding practitioner of yoga, he also worked out regularly at a gym near Churchgate. Should he go with the medical assessment of his knees or should he go with what he felt about himself? – That was the question. Notwithstanding the doctor’s verdict, Krishna Prakash continued his running. “ I kept running despite the knee pain. Slowly I recovered,’’ he said. At the Mumbai Marathon of January 2017, he ran and completed the full marathon. As the crow flies, the forests and hills at the tri-junction of Karnataka, Tamil Nadu and Kerala are some 1600 kilometers away from Hazaribagh. For two decades this region was backdrop for the activities of Koose Munisamy Veerappa Gounder aka Veerappan, notorious forest brigand. By the time Krishna Prakash was training at the national police academy, the infamous Palar blast in which Veerappan used landmines to kill 22 members of a team of police and forest officials – his single biggest mass killing – had already occurred. Through the 1990s and into the early 2000s, Veerappan stayed elusive, even hogging media attention with the kidnaping of Kannada film star Rajkumar. The bandit was eventually shot dead in October 2004, by the Tamil Nadu Special Task Force headed by IPS officer, K Vijay Kumar. In 2017, Vijay Kumar’s book on the rise and fall of Veerappan – Veerappan: Chasing the Brigand – was published. There was a book release function in Mumbai and among those who attended was, Krishna Prakash. The last chapter of the book is titled ` Shootout at Padi.’ In it Vijay Kumar wrote of the bandit, “ Even at fifty two, he was sinewy and extremely fit. Forensic specialist Dr Vallinayagam, who later examined his body, told me he was in the shape of a twenty five year-old, apart from the problem with his eyes.’’ The observation set Krishna Prakash thinking – if that is the fitness level of a bandit evading the law, then police officers tasked with the job of bringing such people to justice have to be as fit, if not better. Among the places Krishna Prakash had served at, was Malegaon. It is a city that has had phases of communal unrest. Three to four days after the book release function, Krishna Prakash attended a ` Peace Run’ in Malegaon. At this run, he met a young doctor who spoke to him of the half Ironman. 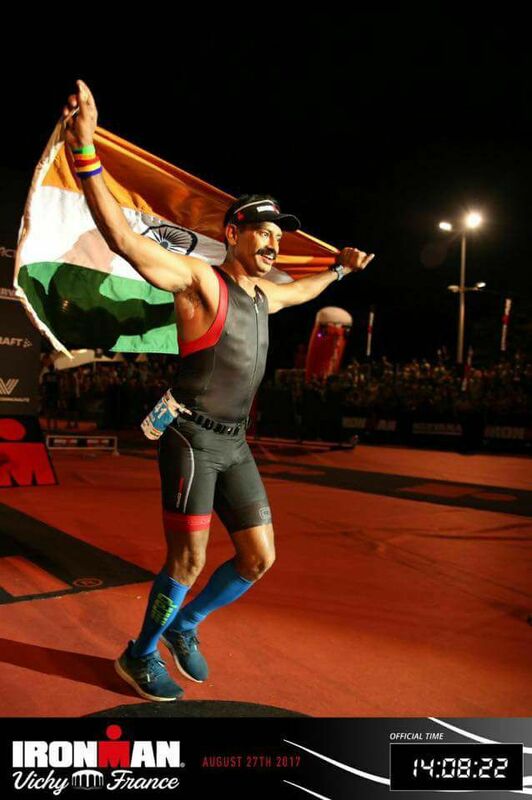 Spurred by his recent thoughts on the subject of fitness and its relevance for the police, Krishna Prakash resolved to do a full Ironman. That’s a big leap; four years into distance running, the full marathon just done for the first time, no dedicated training had in swimming and cycling and here he was, planning full Ironman! Asked if he was taking a chance, he replied with an emphatic “ no.’’ According to him, once he takes up something, he gives it his all. In Mumbai, those who heard of his plan advised him that the route to full Ironman lay through patient training – first triathlons at home, then the half Ironman and eventually the full. Krishna Prakash chose to overlook the suggestions. “ I believe that if a person is confident then he can do what he applies his mind to,’’ he said. A triathlon involving distances greater than what is used for the discipline at the Olympics, Ironman events are held overseas. As yet, India has no Ironman event. Soon after that introduction to Ironman at Malegaon, Krishna Prakash registered for the full Ironman scheduled for August 2017 at Vichy in central France. Vichy is located on the banks of the Allier River. He chose this event partly because the dates were convenient for his family – wife and daughter – to go along. From registration to event, he had roughly two and a half months to prepare. While he had graduated to running the full marathon in January 2017, his swimming was strictly functional in style and in cycling, he hadn’t ever endured long hours in the saddle. To guide him, Krishna Prakash contacted Pune’s well known triathlete and coach, Kaustubh Radkar. The triathlon – which is what Ironman is – has three disciplines: swimming, cycling and running. 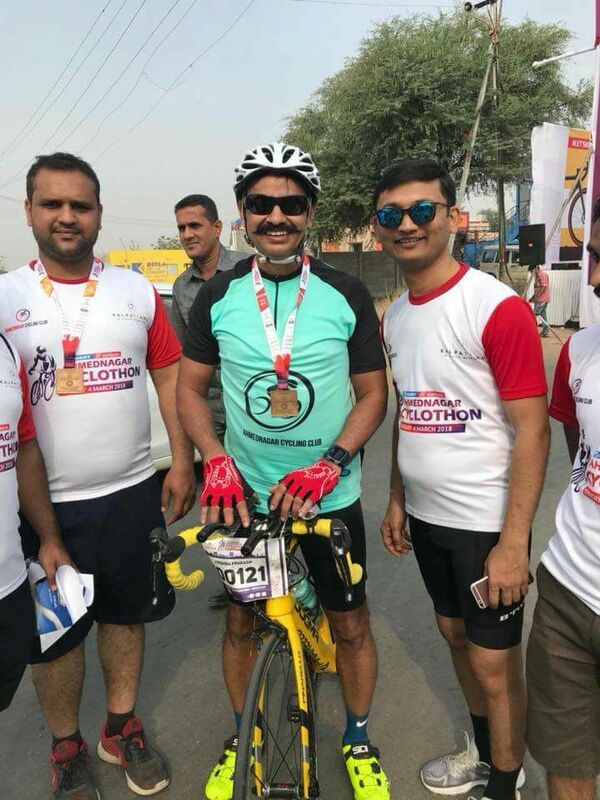 Radkar provided the police officer his training schedules and also told him that cycling is 50 per cent of Ironman; swimming and running together constitute the balance 50 per cent. That latter remark, encapsulating the effort and energy cycling takes up in the mix of disciplines that is Ironman, was a gentle reminder of how much work needed to be done. A full Ironman entails 3.86 kilometers of swimming, 180.25 kilometers of cycling and 42.20 kilometers of running – raced in that order. The rules of service for IPS officers provide you leave to participate in sports. What is difficult for a top cop is finding time to train for a city like Mumbai and a state like Maharashtra are never short of issues to keep the police engaged. Post his Ironman resolution, Krishna Prakash’s day commenced at 3-3.30 AM. By 4 AM he would start training. Being a senior police officer must have helped. To swim, he had access to the swimming pool at Garware Club House at Wankhede Stadium, the Mafatlal Swimming Pool on Marine Drive and the pool at the Police Gymkhana, also on Marine Drive. At all these places, the management was kind enough to open the premises very early for Krishna Prakash to train. In the pool though, he was soon battling his own swimming style. His old survival swimming was a composite of several styles, none of it capable of efficient, sustained passage through water. He gradually nudged himself towards freestyle and focused on acquiring strength in it. His running was usually done on Marine Drive with interval training either at the city’s University Stadium or Mahalakshmi Race Course. Much of his cycling happened on the Eastern Express Highway, which still retains a fairly long stretch of service road used by walkers, runners and cyclists. He also acquired a Fuji road bike. While the triathlon’s three disciplines could be worked on separately, the triathlon itself challenges because they are done one after the other, almost seamlessly. Krishna Prakash earmarked his Sundays to get a feel of that. Some of his training sessions for open water swimming were at Pune’s Manas Lake. Early Sunday morning, he would drive to Pune; in the vehicle would also be his cycle. Reaching Pune by around 7 AM, he would spend the next two hours swimming. Swimming done, he would get on his bike and cycle from Pune to Navi Mumbai, reaching there by evening. Then he would run for about one and a half hours in Navi Mumbai; among the places he frequented so was the jogging track at Jewel of Navi Mumbai in the Seawoods-Nerul area. With most amateur athletes, time spent training is usually time borrowed from family. Krishna Prakash’s daughter Shaurya had to accommodate the reduced time she got to spend with her father. The reality of official life is such that a senior police officer like Krishna Prasad can’t always be left alone. His bodyguards had the option to tag along while he trained. On many occasions, they did. For Krishna Prakash, the full Ironman at Vichy went off well except for one mishap. To cycle, he had brought along his trusted Fuji. Ironman rules, Krishna Prakash said, don’t allow a cyclist to ride close to another for long. The reason is simple and in a different context – that of the peloton; used exactly for the advantages it offers. When you ride close to another (typically behind), it is called `drafting’ or `slipstreaming.’ The practice reduces drag considerably. Krishna Prakash found himself riding close to another and to escape staying so for long (thus inviting disqualification at Ironman), he tried to overtake. Doing so, he courted a smooth patch of green by the road side. What he didn’t know was that lurking below that green was a small ditch. The cycle’s wheel hit the ditch and he fell. This episode aside, Vichy was an encouraging experience. He completed the full Ironman in 14 hours, eight minutes. 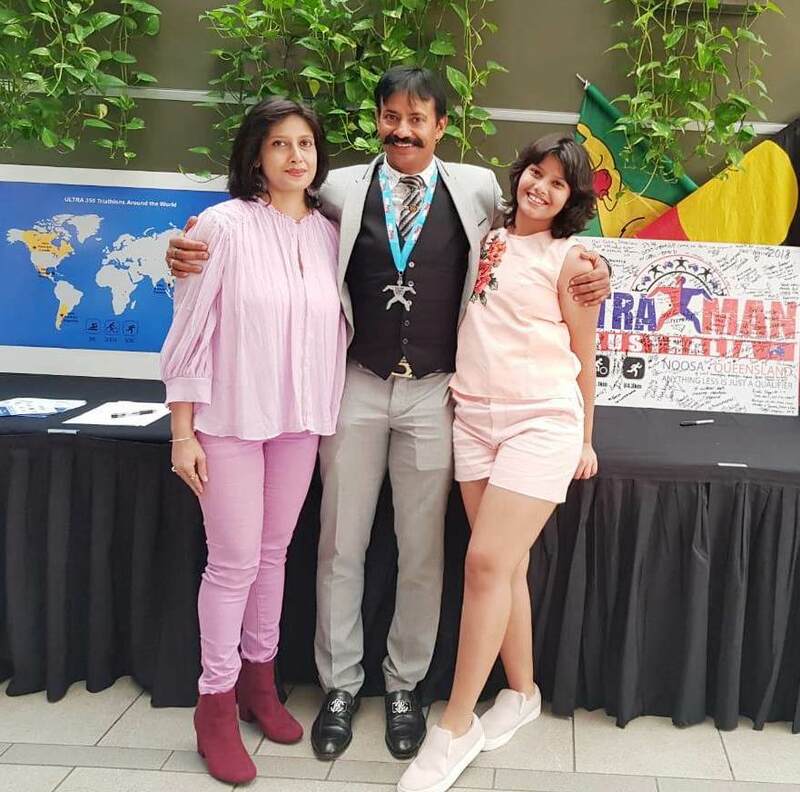 According to Krishna Prakash, in the days following the Vichy Ironman, his sole wish was to try and improve the time he took to complete the event. At a minor level, beside the fall while cycling there had also been another mistake, this one likely fallout of his newness to the whole Ironman format. In the marathon segment which was run in loops with each loop marked by a wrist band given to the runner, he had ended up running four kilometers extra because he thought the run concluded at the place where the band was being distributed. All this required to be smoothed out and a clearer picture of performance had. So he registered for the half Ironman in Bahrain. But in the background there were other pulls and comments seeking to influence. One of it was the observation that his timing at Vichy was actually better than what some famous folks who did the Ultraman, got in their Ironman. Why not then, Ultraman next? – So went that line of reasoning. “ Somehow it came to my mind that I should attempt Ultraman,’’ Krishna Prakash said of his eventual drift towards Ultraman. As before, he wasn’t graduating gently in his goals. He was leaping. According to Wikipedia, the first Ultraman was held in Hawaii in 1983. This was followed by similar events in Canada, UK and Florida in the US. In May 2015, Australia commenced its edition of Ultraman; the first edition was staged at Noosa on Queensland’s Sunshine Coast and saw 37 participants. 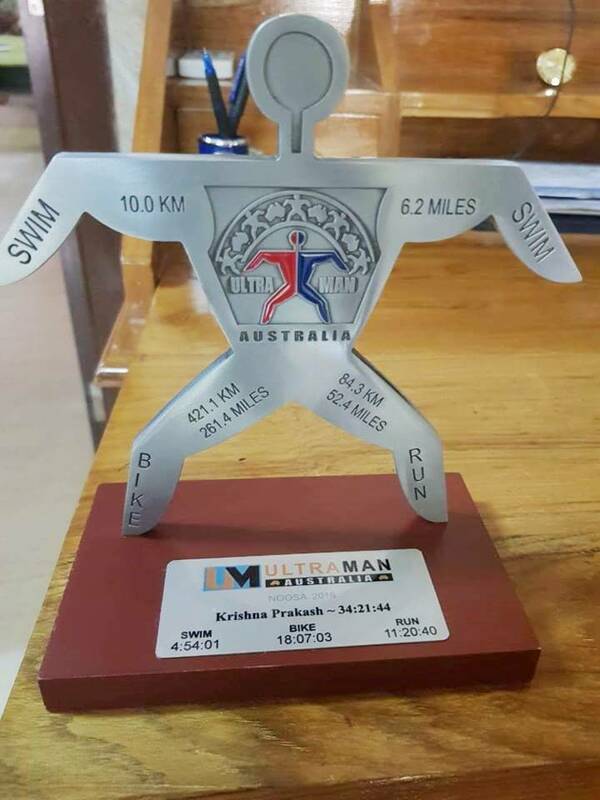 Krishna Prasad signed up for the May 2018 edition of Ultraman Australia. Unlike Ironman, which is over in a day, Ultraman spans three days. Each day’s activity has a cut-off time of 12 hours. On the first day, triathlete does 10 kilometers of swimming and 146 kilometers of cycling. On the second day, it is 275 kilometers of cycling. The event concludes with a double marathon; 84 kilometers of running. As with Vichy, the IPS officer’s choice of Ultraman Australia was partly driven by the fact that it coincided with school vacation in India; it meant his wife and daughter could go along. 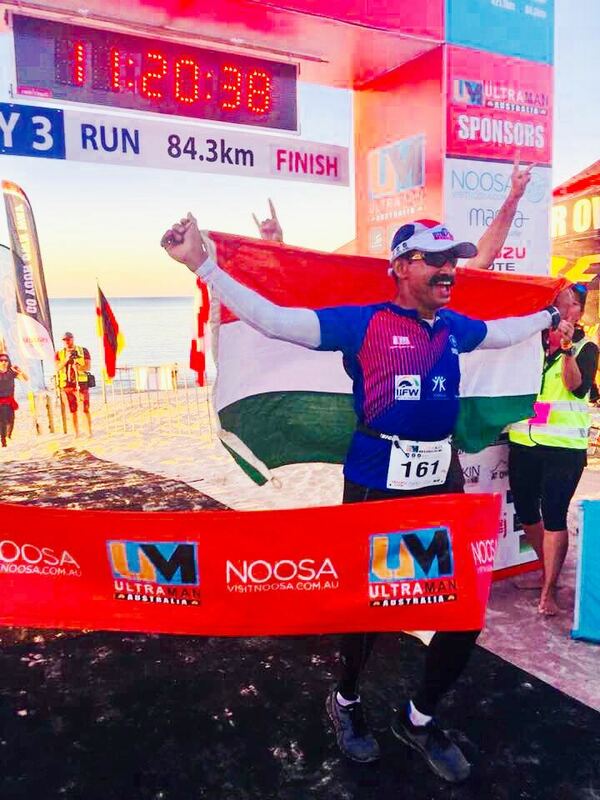 Given he had registered for the Bahrain Half Ironman Krishna Prakash initially visualized his progression to Noosa via Bahrain. Then disaster struck. To get stronger at cycling, he had enrolled for the Deccan Cliffhanger scheduled for November 2017. It is an annual 643 kilometer cycle race from Pune to Goa. During the race, Krishna Prakash collided with his support car and crashed. Apart from cuts and bruises, he fractured three bones in his left shoulder. It was bad enough for him to be briefly hospitalized. “ I was left quite frustrated. It upset my plans. I had planned to do sea swimming near Palghar to get ready for the open water swimming due at Noosa,’’ he said. Yet again, surgery was recommended as an option. Krishna Prakash chose the normal, natural course of healing instead. December 2017 and a part of January 2018 went by without any training. Meanwhile the main sponsorship of the Mumbai Marathon had changed from Standard Chartered bank to Tata; the 2018 edition of the event was called Tata Mumbai Marathon (TMM). On January 20, 2018, his injured shoulder and arm wrapped in bandage to restrict movement, Krishna Prakash ran the TMM full marathon. He completed it in four hours, twenty six minutes. “ That gave me some confidence,’’ he said. With that, one third of prospective triathlon had stirred alive again. In March, there was a 100 kilometer cycling event in Ahmednagar. Krishna Prakash was supposed to inaugurate it. He decided to cycle the distance. Once that was done, he knew he could commence distance cycling as training for Ultraman. Regular bicycle trips from Mumbai to Pune and Nashik started. Not surprisingly, sea swimming followed. That latter bit couldn’t be ignored for the swimming at Vichy had been in a river while at Noosa, it would be the Pacific Ocean. For guide to Ultraman, he had Deepak Raj, Australia-based triathlete and coach. Sunil Menon, Hyderabad based-triathlete and coach, also offered helpful advice. Amid accident, the Bahrain Half Ironman had to be however given a miss. It was now straight from accident to Ultraman. 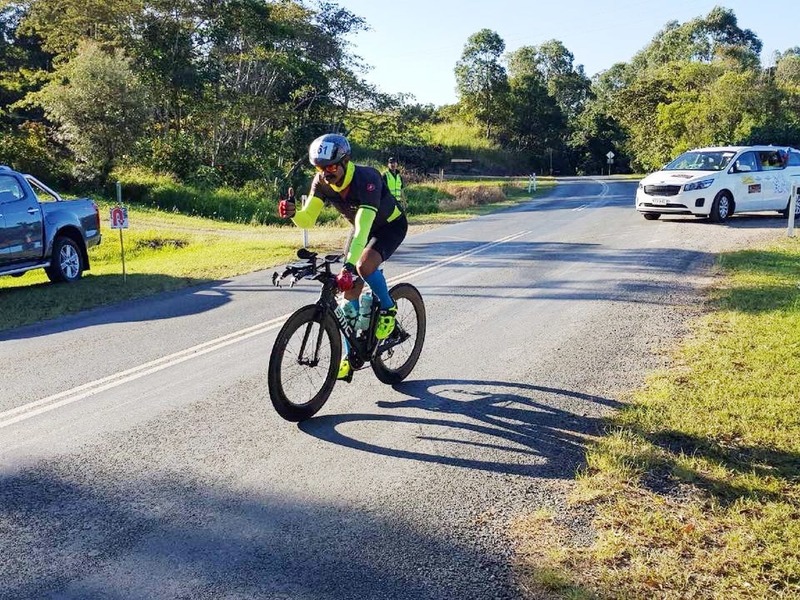 For Krishna Prakash, the three days of May chasing Ultraman in Noosa, were challenging. The quantum of activity each day was sizable and draining and it had to be repeated back to back. But he persevered. He finished the 10 kilometer-swim in four hours, fifty four minutes. The full component of 421 kilometers cycling – first day’s 146 kilometers and second day’s 275 kilometers, combined – was done in 18 hours, seven minutes. He wrapped up the double marathon in 11 hours, 20 minutes; Shaurya ran the last two kilometers with him encouraging him on. In total, he took 34 hours, 21 minutes to complete Ultraman Australia. According to the event’s website, he placed 43 on the finishers’ list. Vichy’s shadow made its presence felt down under too. Krishna Prakash chose to leave his trusted Fuji behind in Mumbai and use a borrowed time trial bike in Noosa. In retrospect, that was a bad decision. The bike fit was far from perfect; the aerobars were short for his arms and although he adjusted the seat as best as he could, he found himself bunched up. Further, the cycle’s brakes decided to play spoil sport; they ran tad lose. Result – on a portion of road close to the city, he swerved to avoid a vehicle and crashed into a wooden fence. His left shin was cut and it swelled up. The area around his right toe also swelled up. The remaining part of the bike ride was therefore cautiously executed. Worse, the injured legs affected his performance in the double marathon. We asked him if he had fully recovered from the fracture to his shoulder before he left for Australia. “ Yes. After all I was swimming,’’ Krishna Prakash said. Then he moved his left shoulder as though to be surer. “ There is some stiffness still, you know,’’ he said smiling. On plans ahead, he preferred to stay quiet, except for a general resolve mentioned to attempt more triathlons.